As I mentioned in earlier posts, in December we were invited at a series of Gospel concerts. On the stage during the concerts we made a short presentation of "Punishment Island" and at the end we collected contributions and gave out more info to those interested. It was a great experience, as the Gospel stage really felt like the right place to share the story. I was really moved myself by the music and I could feel better the weight that that kind of music had in the women's life. At all the three concerts we made (two in Rome, one on the hills around Florence), we had a very warm reception, people got interested in the story and supported it generously. 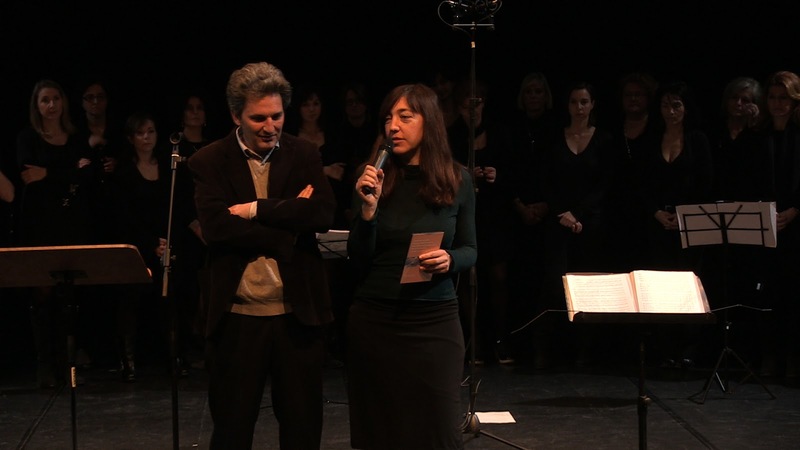 So thank you to both choir, and this is a short video of the first concert we did, 16th December at Teatro Vascello in Rome. Taschler Voices Gospel Choir starring Charlie Cunning! New deadline and thanks to our supporters! Yes, Ulule made us the biggest Xmas present. In a private conversation with the person who is following "Punishment Island" on Ulule, I said: "I don't regret anything about the amount set, because I can't go to Uganda and shoot good material with less, but I regret about not having set a longer fundraising period. It is true that I need to go to Uganda urgently, but especially in this difficult period, it takes time to raise interest about the subject and that kind of money." Next, we received an email with our Xmas present: deadline postponed to the end of January. This is definitely giving us good chances to make it, although we still need your help. It is always an emotion for us when someone supports the story, with any amount they can afford. To express this feeling our graphic designer made a special digital Xmas card. All those who support Punishment Island with any amount within the end of the year - three more days - will receive it by email. And all those at Punishment Island Xmas Fundraising Party at Caffè Letterario in Florence! Soon reporting I will be reporting the great experiences we had presenting "Punishment Island" and crowdfunding at Gospel concerts in Rome and in the hilly outskirts around Florence. In the meanwhile, respectively, a pic from one of the Taschler Gospel concerts in Rome and a video from the Pilgrim Choir Event in Borgo San Lorenzo. All those who came and contributed at Yeah and at the Gospel Concerts! Don't forget that this evening we will be having a fundraising party in Rome. At 730pm we will be presenting the documentary, showing the trailer while having food and drinks. To follow the Aranciotti, a wonderful Roman based duo will play and sing a song from their debut album and after that DJ Set from Prophetic Sound System, a talented couple of friends and party goers! Suggested price for a drink + food + music + support is 10 Euros, but you are welcome to donate more and even not to donate at all. It will be a cool fun evening, and we are hoping it will contribute to our goal: raising 10.000 Euros within the end of the year. If you cannot come, follow us on Ulule whether you can see and read what we are doing and decide if you want to contribute. Soon we are launching a Christmas Special. We are warmly thanking the people who supported us this week, giving us an extra chance to meet our goal and be able to tell this story! Really, thanks! Philine Von Duszeln is a German young woman, documentarist and director of photography. 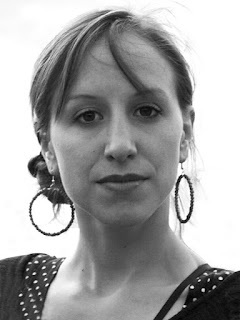 We met earlier this year in Nairobi, Kenya at the EsoDoc International Workshop where I was developing Punishment Island and she was working on Aysén Profundo. In an exciting multicultural context with five documentarists from Europe, five from Africa and five from Asia, we lived together for over a week supporting each other while our projects got discussed, criticized, torn apart, rewritten, re-edited until the final pitch. Luckily our projects survived. I thought that Philine's work was great and shot really well. And she must have thought the same about Punishment Island as when I asked her to come and be the D.o.P she accepted enthusiastically. I am really, really happy to share Punishment Island with Philine and to find her again in Africa where I left her. When the game gets tough, the toughs get dancing! 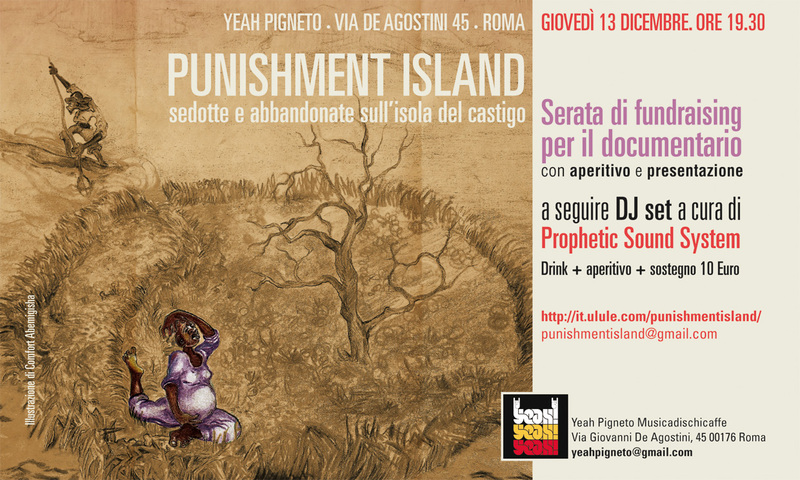 Party night in support of Punishment Island, Yeah Pigneto, Thursday 13th of December! After presentation, dj set by Prophetic Sound System! When the game gets tough, the toughs keep dancing! 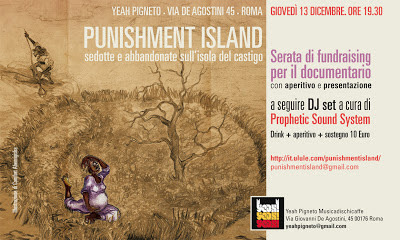 Two great Gospel concerts in Rome which support Punishment Island. Sunday 16th December, 11:30 am at Teatro Vascello, Rome. Monday 17th December 9pm at Auditorium della Chiesa di S. Chiara. On Sunday we will film the concert to show to it to our women of Akampene. Cristina Lo Presti is a young woman, "just made of heart" as her mom says, although she says it in Sicilian and it sounds a bit different. Cristina got involved in the project in October when me (Laura) and the other Cristina (yeah, popular name on the team) were about to launch our crowdfunding campaign on Ulule. Cristina got in touch with me as she wanted some experience filming and editing and when she learnt that I was actually fundraising, she wasn't much interested. However she helped us with camera and sound on the pitch video we did for Ulule and my pitch must have been very convincing, as after that she totally committed to the project "willing to be doing anything it takes to get it made". Her mum is probably right! Officially Cristina is our press agent, but she does all sorts of things, like taking care of screenings during presentations, getting original ideas, contacting people, keeping the enthusiasm high. She made a video for us trying to explain how crowdfunding should work in a real community, a video that makes me and Cristina sob each time. Now she is taking care of a Punishment Island support Xmas Special - looking forward myself to see what she creates. Although we didn't speak to each other then, me and Cristina graduated together in Human Geography on the same day, me with a thesis on Malawi, her on India. She then she went on to the Master Degree in Geographic and Anthropological Studies. Cristina has cooperated as trainee with the Italian Journal of Geography and she recently attended a Direction class at a cinema school in Florence. She directed the documentaries "As social reading of the Florentine squares" and "Central Market of Plural Vision". She seeks the best way to combine scientific and visual research methods and she is now writing her thesis about street art and public space. Next time, she will be involved in filming and editing, that's my promise to her and it will work magic (literally). Comfort Abemigisha was our translator on the development shoot, but personally for me (Laura, director) was a bit more than that. We were together on an adventure with an extremely difficult task set: finding survivors of Akampene when nobody knew if they were alive nor where they lived. At times, most times, it felt like something really crazy to do, basically no budget, bargaining boats really hard to go up and down the lake as soon as we heard there was a small possibility. Despite storms, false witness and all kind of misadventures, we never lost hope and we generated such a huge amount of energy that at the end it really happened. 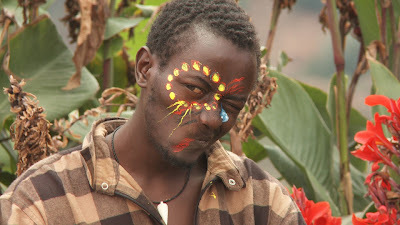 Apart from speaking Rukiga and English and generating good positive energy, Comfort is an artist who majored in photography, illustration and painting. He is 23 years old, originating from Kabale (South-Western Uganda) and living in Kampala, capital city. He will be graduating in January 2013 with a BA in Industrial and Fine Art. Comfort mainly uses pencil for sketch and extreme mood and detail, pen and ink for motion and moment capture and oil and acrylic paints for dream, observation and individualistic recomposition in visual arts. He also loves film and he is involved in video production and post with his baby production company K Concept. He is also involved in the art project "Otariho Tagwegwa Muti Country" (When a tree falls, if you are not around, you won't be hit). If we manage to complete the film - we have to - Comfort's involvement will carry on in his favorite and real role: he will make the series of drawings that will accompany the women's tales.